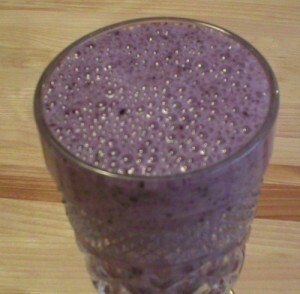 How about a “Blue Moo” Smoothie? I’ve been experimenting with smoothies a lot lately. Spring is coming (although here in the Midwest, it seems like it’ll be forever before it arrives). People will be looking for “cooler” foods to enjoy when the weather warms up. Hence, I want to have a lot of such recipes ready. So…I’m enjoying smoothies galore, even if I have to drink them with my coat on! This entry was posted in Food, Smoothies and tagged blueberry smoothies, smoothie recipes, smoothies, smoothies with banana and blueberries on March 7, 2014 by Judi.